Have you heard of watercress? It's a semi-aquatic plant which is just packed full of nutrients and minerals. Pound for pound it has more vitamin C than oranges, more calcium than milk and more iron than spinach. So if you've always wanted to out-Popeye Popeye, here's your chance! I hear Olive Oyl likes 'em large. Watercress goes by the botanical name Nasturtium officinale. Nasturtium means "nose twist", because of the peppery, tangy flavour it shares with related species. And if you remember our look at the Common Cuttlefish (Sepia officinalis), you'll know that names like officinale and officinalis come from the Latin officina, which was the room in a monastery where the monks kept their medicinal herbs, mushrooms and other useful items (like cuttlefish ink for writing). Watercress has a long, storied history dating back to its time as perhaps the earliest leaf vegetable ever eaten by humans, to its time hanging around with some beef and horseradish in the 4th Earl of Sandwich's sandwich. 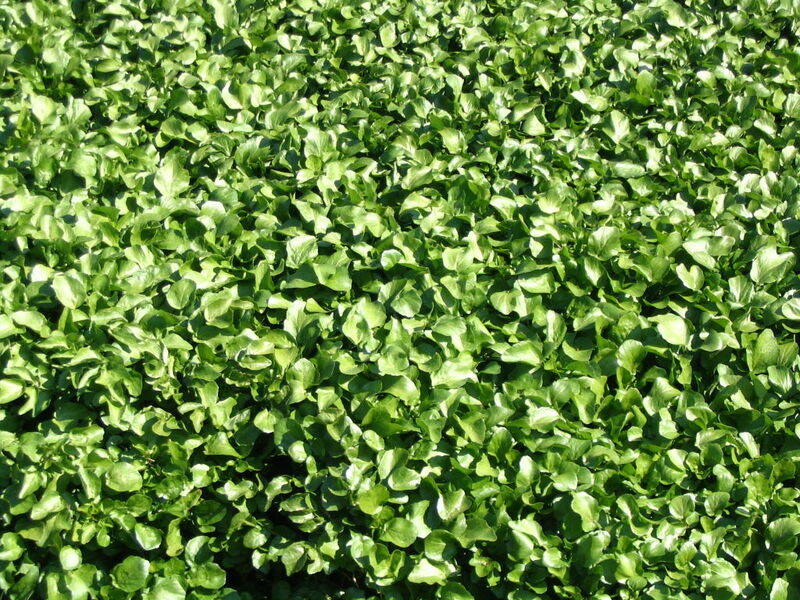 The Egyptians gave watercress to their slaves so they'd work harder, the Greeks ate it to hone their wits and the Romans ate it to prevent baldness. 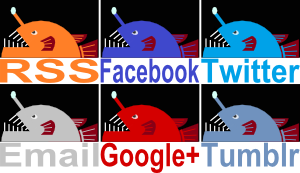 Are you enslaved by the office cubicle? Try watercress! Want a witty way to tell your speed date that you're enslaved by the office cubicle? Watercress! These days we've discovered it has positive effects against lung and breast cancer and that its great for the skin. Basically, it's great. Inspired by the ancient and ongoing glory of watercress, a whole subculture of watercress enthusiasts has grown up in Britain. It's centred in the south of England, where numerous watercress farms in the counties of Hampshire and Dorset along with the three biggest producers, Alresford Salads, Vitacress and The Watercress Company, have organised themselves into what they call the Watercress Alliance. There is also a steam railway known as the Watercress Line, a "Watercress Queen" and an annual festival in the town of Alresford, where truckloads of watercress are openly sold in the streets and everyone in attendance smiles and dances because of all the watercress. And I got to go to one of those farms! Abbotts Ann Watercress Farm in Andover, to be exact. 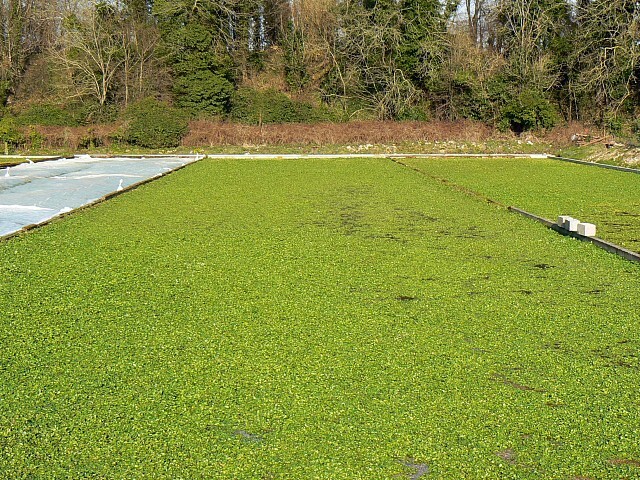 The watercress is incredibly luscious and green and constantly supplied with mineral-rich water from boreholes. Do you know what would completely ruin it? Well, yeah... a nuclear winter... But also feathers and droppings from a pigeon. With regard to the nuclear winter, we'll cross that bridge when we come to it. For the pigeons, however, it's time for the farmer to pull out the big guns. 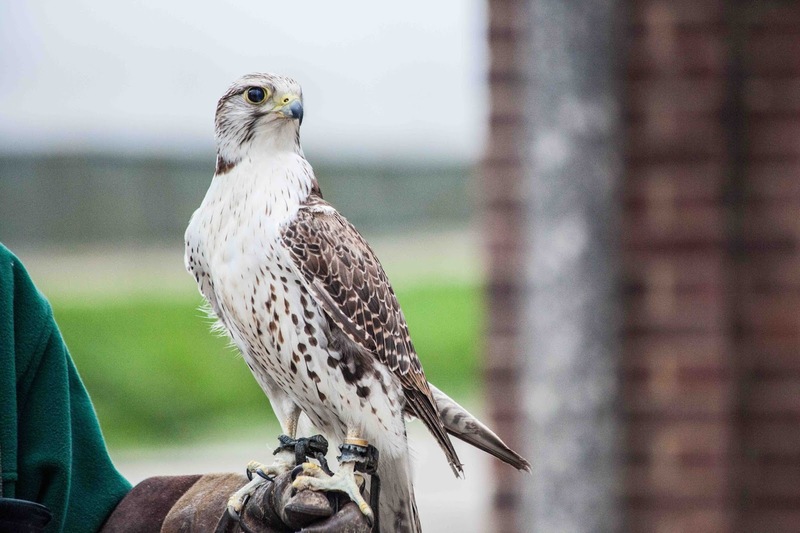 And so is this Gyr Saker Falcon. That's two, independent scourges. Nice. Both of these raptors were constantly looking around at everything there was to see and were clearly itching to fly off and kill a thing. The farmer fed the falcon a chick and we all watched as it was torn to pieces because it isn't really nature unless something gets torn to pieces. The falcon had also deposited a fresh SPLAT of droppings all over the floor a little earlier, so I think we all learned a lot about what it means to be a falcon. After those big, keen-eyed birds of prey came quite the opposite. 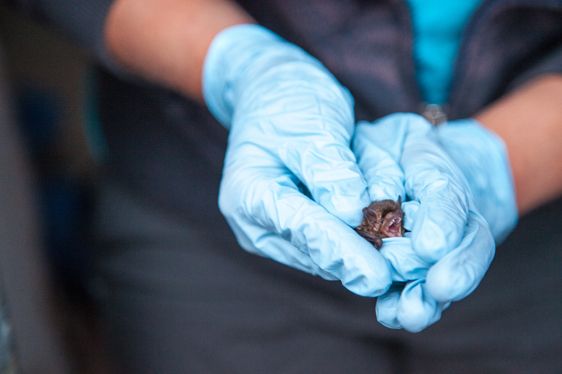 Two members of the Bat Conservation Trust came along with a pair of injured Pipistrelle Bats who really enjoyed each other's company and were constantly squeaking at each other. They're absolutely tiny! Yet they can still eat some 3,000 midges in a night! Bat numbers have declined a lot in the UK over the past few decades due to habitat loss and increased use of pesticides. The Bat Conservation Trust works with people like the Watercress Alliance to help farmers provide a safe space for bats to prosper and eat all the insects that might otherwise get into the watercress. And so off we went to the woods on the edge of the farm. Pipistrelles were flittering around high up in the trees. The call they use for hunting insects is of a much higher frequency than the ones they use for communicating with each other, so we were armed with bat detectors to hear them. These things were like walkie-talkies which detected their calls and took it down a few notches for the human ear. It was a bit scary sometimes; it sounded like we were getting shot at by a World War I biplane! There were also Daubenton's Bats flying up and down the nearby river catching insects along the way, which was tremendously cool. It's wonderful to see so much effort taken to help out the bats! 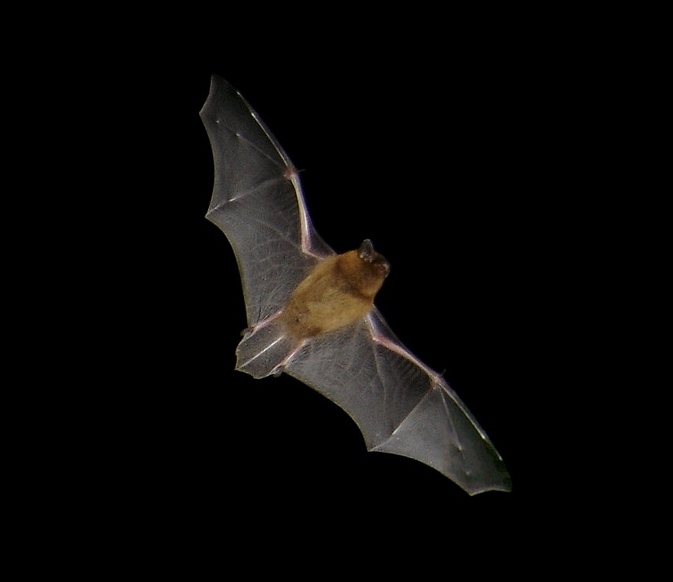 As recently as 1999 it emerged that the Pipistrelle wasn't one species at all, but two. There's always more to discover. I myself discovered a whole new bit of greenery to throw in my salad. 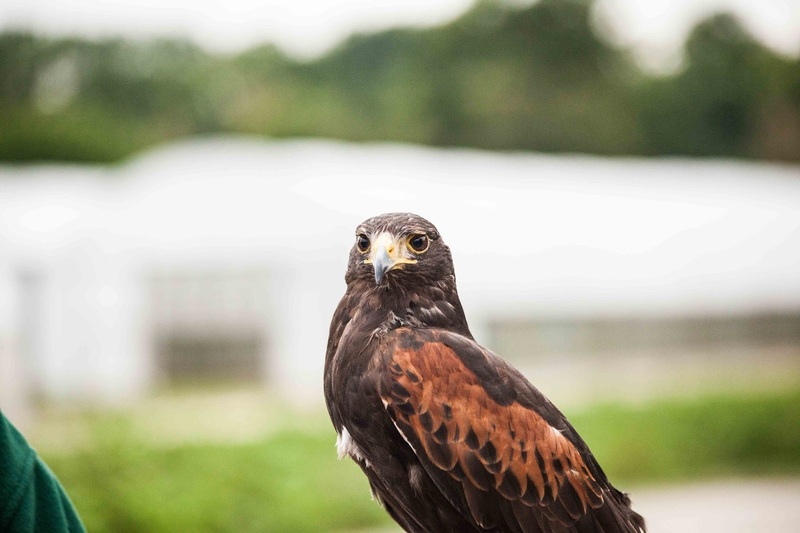 Check out Emily Lear's blog A Mummy Too for more pics and big, scary hawk claws! can't say i've had watercress. On the other hand, who knew watercress would be so helpful for an endangered species? @TexWisGirl: You should tear apart some watercress! @Porakiya Draekojin: Watercress is surprisingly versatile. I know because they gave me a recipe book, too! I'm even more jealous, now!